Now we have a context for the the final of our core bandhas. 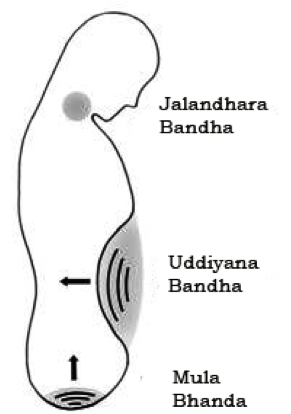 Jalandhara bandha is the bandha of the throat. It draws the energy from the thorax into the head. For me, jalandhara bandha is an integrated interplay of the thoracic inlet, the vocal diaphragm, the hyoid, the mouth and cranial diaphragms. It is often taught with the image of holding a ball or a piece of fruit between your chin and your chest. I find this isn’t enough for me. It’s not a complete picture of what’s possible. I like to maintain the horizontal lift of both the thoracic inlet and the shoulder diaphragm. I maintain the breadth of the vocal diaphragm and the palate and the softness of the tongue. The hyoid draws back as the palate and the cranium lift up and bow forward, chin towards chest. In this position, I can still breath and I can still speak with a normal voice. The position is typically used in pranayama with breath retention and/or swallowing to create a containment of breath and prana for different purposes (which we won’t go into here). We also find ourselves in this position in poses like bridge, plow, and shoulder stand. How can we use this information to find a plow pose that neither compresses the cervical spine nor the structures traveling though the throat and thoracic inlet? These poses offer toning of the throat, thyroid and other structures of the anterior neck. We want to make sure we are toning and not compressing. Awareness of the relationship between these structures can also create a more subtle variation of jalandhara that underlie head placement, cervical integrity, and a sweet stillness for meditation. One last thought on bandhas: We do these exercises to wake up the tissues, to build awareness and access. But these exercises are not goals in and of themselves. Once awake, bandhas are available to you spontaneously as you need them, both for your practices and for everyday life. It is possible to overdo. These structures need to be dynamic, elastic, and supple. So spend a little time building awareness and tone and then observe how they support you without trying to make it happen. Trust that you’ve done the work and then let it work for you.